A lovely secure 2 bedroom ground floor apartment ideal for couples or families. The apartment includes the use of a car during your stay. The property has wifi & British TV. The property is within 5 minutes walk of a 24 hour bakery & supermarket. 15 minute walk of the village centre. Oroklini is the ideal location if you want to experience traditional Cypriot village life. The pace of life here is very slow and relaxing. The apartment is fully air conditioned in the summer and heated in the winter. The outside terrace is south facing, spacious and private. Open aspect view to the front and plenty of open space for children to safely run and play. 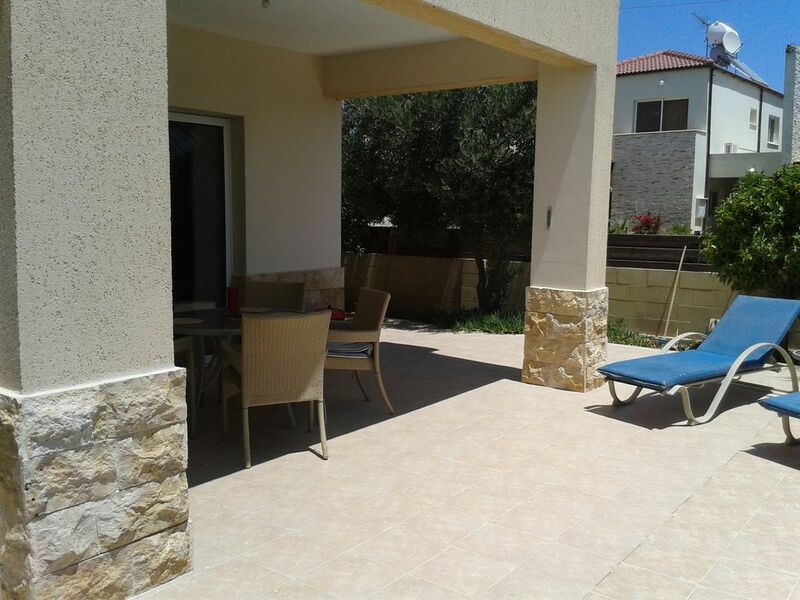 Apartment is 2km from the Dhekelia Road, which has all the international restaurants and bars. Here you'll find the blue flag beach. Oroklini is a great base for exploring the island, whether by car, on foot or on mountain bikes. Ayia Napa is 20 minutes drive away. Nicosia is 25-30 minutes drive away. Larnaca airport is only 15-20 minutes drive away. Family bathroom with WC, bath with shower over, sink with vanity unit and large mirror. 3 seater sofa which is a double sofa bed (very easy to set up), 2 seater sofa, arm chair, wifi, British TV, films and box series on demand, DVD player, stereo, books, games, for guests to use. The kitchen is very well equipment. There is a cooker, hob, fridge/freezer, washing machine, microwave, keetle, toaster, iron, ironing board, clothes airer, kitchen utensils, pans, dishes, crockery, glasses etc. Google Chrome & Smart TV. Watch internet channels. Ideal if you have an Amazon & Netflix account. Selection of board games and jigsaws for guests to use. South facing private secure garden with 4 sunlounders, table and chairs and BBQ. Skiing is available in the Troodos Mountains in February. Is approx. 45 minutes away. Cyprus is one of a few destinations that you can ski in the morning and swim in the sea in the afternoon. The property is on the ground floor and does not have any steps. The doors are wide enough for wheelchair access. Easy access for pushchairs. The parking space is under cover right outside the front door. We allow smoking in the garden. Notes on accommodation: Free wifi for guests. Live British TV, film & TV series box sets on demand, We also include a welcome pack of tea, coffee, sugar, water and milk. The inside of the apartment is no smoking, but smoking is permitted on the terrace. Property has heating as well as air conditioning. Suitable for children. Parking space is right outside the front door. We own a Fiat Punto and you can use this car during your stay and no extra cost. It is fully insured and there is no excess/extra charges for you to pay. Age restrictions apply. Outside: Large south facing walled secure garden (safe for children), patio table that seats 5, BBQ, 4 sun loungers with cushions, fruit tree's. Open aspect views. There is a shared pool (20 metres from apartment). Cleaning / Towels / Linen / Maid service: Bed Linen and bathroom towels are included in price. Linen is changed once during a two week stay. Other: A high chair is available to use at no extra cost. Thoroughly enjoyed our holiday here. Fifteen minutes from the airport and very easy to find from the directions provided. Well situated for touring the eastern end of the island and further afield if you wished as only a short distance from the motorway. In a lovely quiet village with many shops and eateries and two really good bakeries. Set in an area where many Cypriots lived, it had lots of secure outdoor space both in and out of the sun, with a lovely view over farmland. Very well equipped with everything you needed and the car was a great asset. Nice open plan living with plenty of space and 2 good sized bedrooms. Excellent value for money. If we visit Cyprus again we will definitely stay here again. Well equipped, spacious and very private apartment with pleasant south facing patio. Smart TV was good for viewing British programmes-we used Netflix. Comfy and reliable car got us around with no problems. Great location for local shops, tavernas and bars. Great value for money and the owner was very prompt and helpful in replying to our queries. We love the area and will definitely return. Ideal large 2 bedroom apartment with great outside space. We were really impressed with the apartment. It had everything we needed, including the use of a car and was in an ideal location for what we wanted. After reporting that the bed was a little hard the owner arranged for a mattress topper to be purchased. We will definitely return if we need to rent accommodation in Oroklini again. Firstly I must apologise for the very late review time just flies by..
We originally requested Tracy's other property book as we were discussing it someone booked it online Tracy apologised and advised me that this property had been provisionally booked but not confirmed she would contact me if it became available. A day or so later Tracy true to her word contacted me and I took her up on the offer, She advised me that a car was available free of charge and gave me the details of the local taxi company for airport transfers. I booked the taxi and off we went the taxi arrived on time and took us to the villa. Bit of a hiccup with electric key not having been left at the property but that was sorted with 30 minutes. The villa was as described well equipped and well presented there was plenty of outside space. The car was a great addition we went to the supermarket on the high street some 800 meters away and got everything we needed, the pool was on the other side of the track and some 20 paces away from the villa . We used the car every day nipping to the shops , beach ,waterpark we went for a lovely drive into the mountains and only needed to fuel it once in 2 weeks. There is a fish and chip restaurant and a 24hr bakery within 400mts of the villa which we visited every night on the way home. Overall this villa and use of the car was well worth the money I cant praise Tracy enough myself my wife and 11 yr old granddaughter loved it , would I go back / recommend it "absolutely". Once again thanks for sorting this out for us at short notice sorry about the delay in posting. Our 10 day stay in Oroklini March 2016. My family and I have just returned from our 10 day stay in Mick and Tracy’s wonderful Apartment in Oroklini. Within the apartment one has everything one could possibly need and much more, so no need to pack anything in your cases other than clothes to wear. Oroklini is a lovely village with a large and very friendly Expat community and more than enough Taverna’s, bars and restaurant to eat in a different one every night. The apartment is exactly as described in the previous reviews and much more, we loved our stay so much we will most definitely be going back in the future. Contact with Gayle was superb especially as she came around the day we were due to leave to inform us if the highjack at Larnaca Airport caused our flight to be cancelled then the accomodation was free for another week. Sadly our flight was not cancelled. 6 of us had a fantastic weeks family holiday at this lovely apartment in December 2015. Its very light, airy and clean. The patio area is a real plus. If you're looking for somewhere to chill out, then this is the place. There's lots of great places to eat in the village, some are really traditional and some are more typical of what you'd expect back at home. The apartment is brilliantly situated to explore the island and the driving is really simple and easy for the less experienced. I'd highly recommend this apartment and am planning to go back in 2016. Beach is 2km from the apartment. It is a lovely blue flag beach. You can walk to the beach (20 minutes). Larnaca Airport is 15 minutes away from the apartment. A car is essential and therefore we have included our own car within the weekly rental price, to save our guests having to hire a car. Car hire in Cyprus is getting more expensive and occasionally hidden charges are applied when you collect the car. A taxi from the airport to our apartment is low cost - approx. €20-€25. 24 hour bakery which stocks essentials is 5 minute walk away. Restaurants, supermarket, cash point 15 minute walk away. Larnaca is a 7 minute drive away, where there is a large Carrefour (full directions provided in apartment). Ayia Napa/Nissi beach is a 20 minute drive away. Oroklini is open all year round and offers some great traditional Cypriot restaurants. The pace of live here is very relaxed. Booking Notes: £50 non refundable deposit secures booking. £75 damage deposit is required with final payment. Final payment required 6 weeks before departure. If booking within 6 weeks of departure payment is required in full, including damage deposit. We accept payment by cheque, bank transfer or Paypal. We offer discounts for bookings of 3 weeks or longer. Use of car for those aged 25-70 with full licence held for min 2 yrs. Changeover Day: Changeover day is completely flexible. Arrival after 4pm. Departure 12 noon. However we can be flexible where possible. If you have a late flight and there is no one renting the apartment straight after, we will let you stay later without any charge.